On March 21, 2019, the BBC ran a story titled “Chinese imports ‘driving fishermen to despair.’” Although the title might lead one to think the article is another installment on the US-China trade war, it is instead a piece on the relationship between China and Kenya. The situation covered by the BBC is a highlight of the intersection of environmental concerns, economics, population dynamics, and social reactions. At the root of the problem is Kenya’s Lake Victoria, the nation’s primary source of fresh-water fish. Decades of mismanagement and environmental abuse have caused the lake to become depleted of its fish stocks whilst also becoming so polluted that the fish would be inedible regardless. With the local resources incapable of supporting the demand of an increased population that was also hesitant about eating contaminated food, fishmongers responded by importing farmed fish from China. The entire situation is a textbook example of the case for and against free trade. A freight-driver interviewed by the BBC said: “thanks to this Chinese tilapia, poor people can now eat nutritious protein-rich fish as well.” The source added that the driver earns approximately $300 per day, much more than the average monthly salary, through driving the fish cross-country. On the one hand, this part of the story is indicative of the benefits of free trade – cheap, healthful food and low-skilled employment. On the other hand, there are concerns, such as the eponymous fishermen of the title. It is inaccurate to say that they are being driven out of business entirely by Chinese competition. 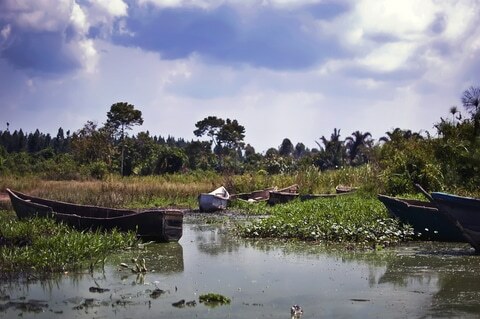 According to the report, although there is a cultural preference for local fish, residents have been concerned for some time about the effects of pollution in Lake Victoria on the fish supply – sensible people generally don’t eat foodstuffs that are known to be contaminated. The domestic market was already losing interest in the local product, and the arrival of farmed, unsullied fish from overseas merely sealed a growing trend. As the problem for which they are directly responsible, overharvesting, has increased, so have the costs borne by the fishermen. For example, one man told the BBC that the shoreline fish breeding grounds are now off-limits as part of a government initiative to revitalize the lake. Consequently, the fishermen’s overhead now includes the expense of extra fuel to go further out on the water and any potential fines incurred through sailing too close to the restricted areas. Additionally, the man interviewed complained that if he and his co-workers do manage to catch anything (something which is uncertain due, once again, to overfishing), they are often unable to sell it, leaving them with a load of spoiled fish. Myopically, though perhaps naturally, the fishermen lay blame for their plight at the door of the Chinese competition, and the industry lobby even briefly obtained special protections from the Kenyan government, which ultimately reversed the decision. The moral of this pathetic tale is the aspect that free trade has an uncomfortable tendency to reveal the incompetence or lack of foresight of individuals and groups. More harshly, an impartial observer sees them as the architects of their own failure. It is true that in the example situation, the fishermen are not responsible for the chemical pollution of the lake, but they and the generations before them are culpable for the overfishing which occurred separately from the other problem. It is the same case as of slowly diminishing the principal in an investment. Eventually there is nothing left. In an intimate setting, a village for example, if one sees a family in which the parents waste their substance, leaving little or nothing for their children, one might feel sympathy but not responsibility. It is not, after all, incumbent upon the rest of society to bear the cost of the short-sightedness of a single family, or in this case a specific group of individuals. It is even less so if, across the generations, there is persistent repetition of the same mistakes, e.g. insisting on catching a load of fish even while knowing that the probability of selling is low and that available stocks are diminishing. Yet, forcing the entire community to suffer for the poor decisions made by a smaller group of people is exactly what trade protections achieve. In the case of the Kenyan fishermen, the reversal of their special protections came, not because the government heeded the needs of the market (based on the report, it appears as though the government was perfectly happy to give its citizens a choice between no fish or poisoned fish) but because the Chinese used diplomatic channels to protest. Even harder for some is the feeling held by those in the position of the fishermen that they are skilled workers, while the chipper freight-driver is an unskilled nobody whose prosperity is unfair because it is disproportionate to his perceived knowledge level. To be fair, there is no hint of any such dynamic in the report on Kenya, but it looms very large in more industrialized countries today. Though to return to the example of the fishermen, one might pause in the midst of emotion-triggering rhetoric, such as “driven to despair,” and ask what real skill is expressed in simply exhausting a resource. If one removes the word “fish” and replaces it with a variable representing an industry in similar circumstances, one has the equation for most popular discontent with free trade. The inconsistencies and failings of small groups are exposed for all to see. And the rest of society is not likely to be particularly sympathetic, especially if their pocketbooks, or health, suffer. In this way, yes, free trade can be socially divisive. But no more so than protections since it is implicit that before the arrival of the Chinese farmed product, fish was a luxury instead of part of a normal, balanced diet. Perhaps it is also an irony of free trade that it provides a chance for a nation to choose its divisions – in this case through health or through wealth. Mary Lucia Darst was an intern at the Austrian Economics Center from January to April 2018. She graduated from Columbia University with an MA in History and Literature. In addition to working as a writer and researcher, she is an active classical musician.